Alfresco Dining is a highlight of this years summer. Apparently this great long hot Summer is set to continue which means that we will have an abundance of beautiful fruit and vegetables coming through our kitchens. Plump gooseberries are in our local greengrocer along with bright red strawberries, peaches and deep red cherries. Radishes, french beans and fennel to make crunchy salads to enjoy al fresco but there’s nothing quite like the taste of fresh tomatoes picked from the vine. Although there are many different varieties of tomato they are easy to grow and all love the sun as anyone with a greenhouse or allotment will tell you.. Even if you only grow a couple of these plants you will have sufficient for your salads and some left to preserve. We like to preserve them by drying them slowly with thyme and garlic, to use in pasta or cook the big juicy ones into tomato sauce. 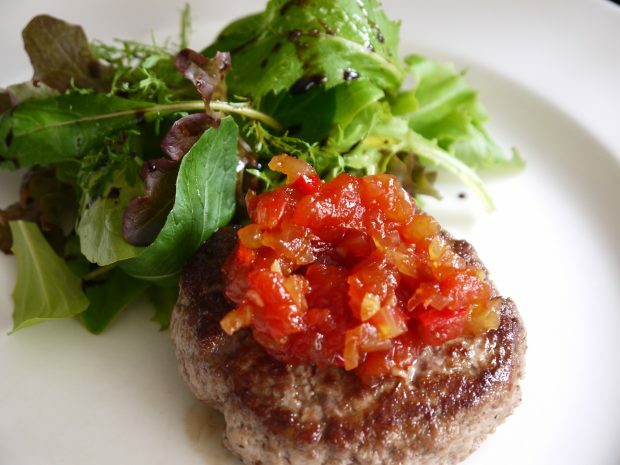 The rest we turn into tomato jam spiked with red chillies which is fab with burgers, a little salad and that great British summer. 4 Put into sterilised jars and store in a cool cupboard.